Once you've given thought to the unique life and personality of the decedent, it's time to incorporate those memories into the funeral plan. Be creative. Share your thoughts with your friends and family as well as the funeral director. Many times the funeral director will suggest personalization ideas to the bereaved family that otherwise would not have been thought of. Each of these elements can be personalized in many ways. If you're having a visitation, for example, you could set up a display of photos, memorabilia, collections or artwork. You could do the same at the gathering following the ceremony. Choose music that was meaningful to the person who passed away or to your family. Select poetry and other readings that speak to the life of this unique person. Ask the people who were closest to the decedent to participate by playing music, giving readings, being pallbearers, making food for the gathering-whatever suits their own unique talents. Have more than one person deliver the eulogy. Ask several people to share memories and talk about different aspects of the decedent's life. Choose clothing for the decedent that reflects his / her life, interests, passions, etc. The clothing needn't be formal or somber. Just make sure the clothing fits your loved one's personality. Create a personalized program for the ceremony. You can include photos, poems, music-whatever you'd like. Show a videotape or slide show of the person's life during the funeral. Pictures sometimes mean more than words can say. Ask children if they would like to write a letter or draw a picture. Their "goodbyes" can then be placed in the casket. Select the decedent's favorite flowers. A simple arrangement of freshly-cut lilacs, for example, might be perfect. 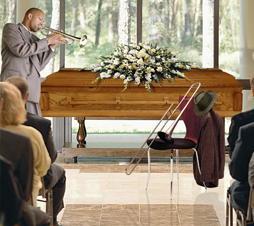 Create a funeral that captures the personality of the person who passed. If he was zany, don't be afraid to use humor. If she was affectionate, have everyone stand up and hug the person next to them during the ceremony.